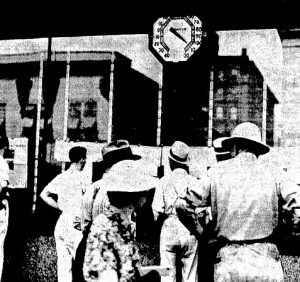 The worst heat wave ever in Sangamon County – 12 straight days when temperatures reached 100 degrees or more – killed 33 people in July 1936. The stretch of torrid weather began on the Fourth of July and continued through July 15. Thermometer readings reached 103 or above most of those days. After a relatively tepid July 16 – a high of “only” 98.8 degrees – the heat on July 17 was back to 100 degrees. The hottest days were July 12 and 13, when meteorologist E. W. Holcomb recorded highs of 108 and lows of 83 and 84 degrees, respectively. Holcomb took his readings at a small building just east of the U.S. Post Office at Sixth and Monroe streets. 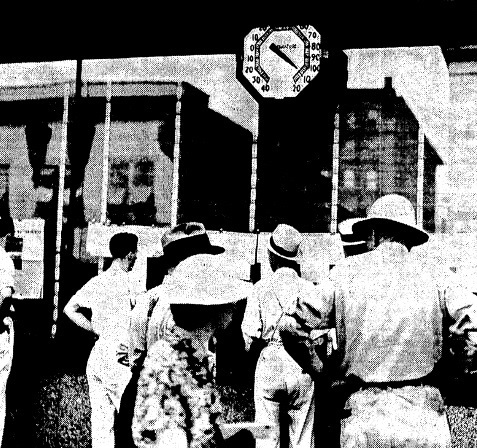 An unofficial thermometer at the Illinois State Journal’s office, just a block away, reported the temperature reached 109.5 degrees shortly after 3 p.m. on July 14, which at the time would have been an all-time record for Springfield. Residents coped with the first few days of blazing heat. The first death, that of Ancil T. Cox, who collapsed while building a foundation for a home on South Second Street Road, wasn’t recorded until July 7. But as the temperature refused to relent, people began dying in bunches – two on July 9, four on July 11, three on July 12. The daily death toll peaked at seven on July 13. Most of those who died were in their 60s or older, but some younger people, like Elizabeth Scheining, 38, of 2100 Cornell Ave., one of those whose deaths were recorded July 13, also succumbed. Lake Springfield, only one year old in 1936, may have been a literal life saver during the heat wave. Swimmers thronged Lake Springfield Beach – 3,047 on July 5 alone – and record amounts of water were pumped from the lake on a daily basis. Thousands more bathers took advantage of Memorial Pool at Ninth Street and Converse Avenue, which had opened in 1928. 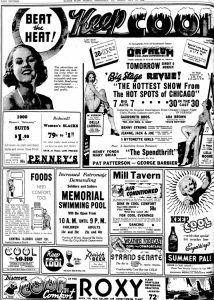 A few entertainment spots, such as movie theaters and some nightclubs, even boasted air-conditioning. 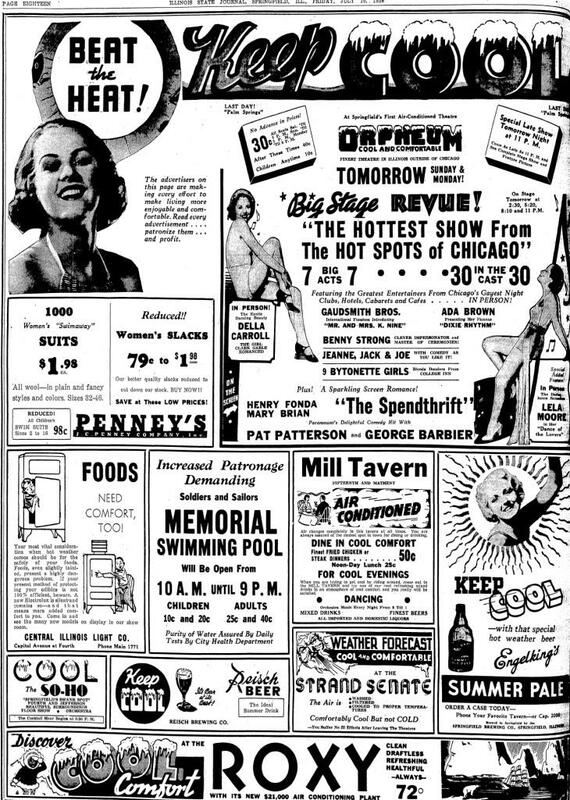 The Strand and Senate theaters were “Comfortably Cool But not COLD” and promised “You Suffer No Ill Effects After Leaving The Theater.” The Roxy’s ads depicted Eskimos, ice bergs and polar bears. Relative relief began only on July 19-20, with highs in the low 90s. “The high temperature of the day – 92, reached early in the afternoon – seemed comfortable in contrast to the plus 100 degree marks of the fast retreating heat wave,” the Journal reported on July 20. The retreat was only temporary. More daily heat records were set in Springfield July 25-27, with highs of 103 to 106 degrees, bringing to 16 the number of July days with highs above 100. However, authorities reported no deaths from the second stretch of hot weather. This entry was posted in Disasters, Weather. Bookmark the permalink. Love this article! So fascinating to see history repeat itself!